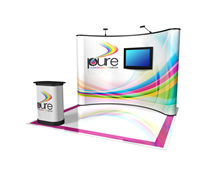 Need help finding the right trade show display? 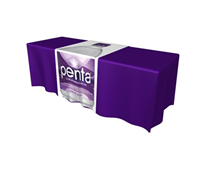 puts your graphics center stage. 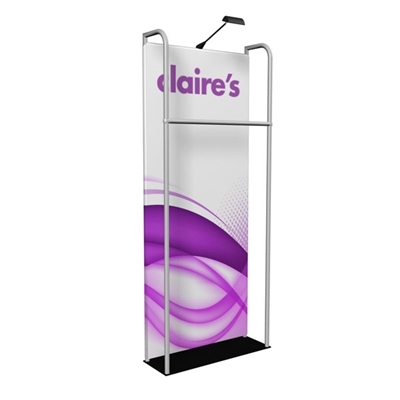 on this lightweight fabric stand. opportunity to share your brand. 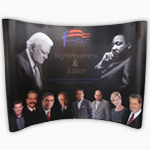 full color stretch fabric graphic. 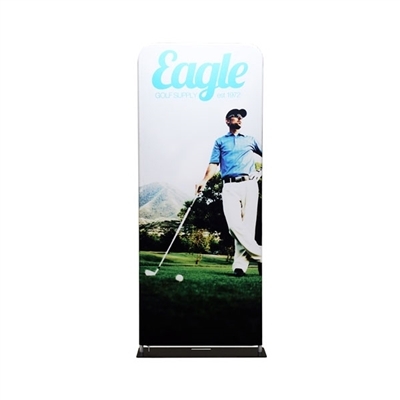 A user friendly design with durable graphics and many custom options. 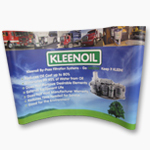 with fabric graphics and many sizes. 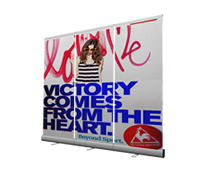 Twin tension fabric panels with varied height gives you a dynamic display with ample graphic space. 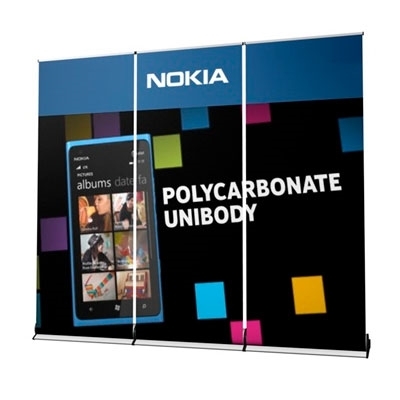 Two "fin" panels combine with your center fabric panel for one of the most uniquely attractive displays. 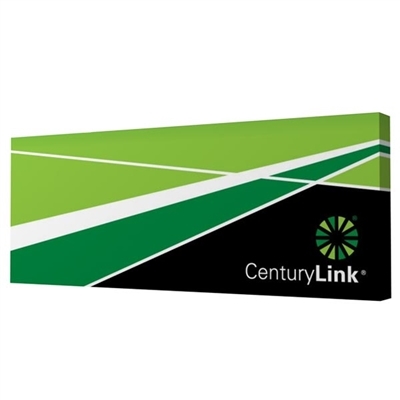 Tension fabric straight wall with spacious graphic opportunity and header option. 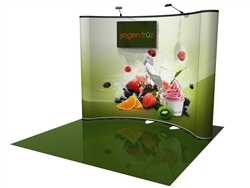 Towering end panels and shorter center panels create a dynamic booth with striking graphics. holder for a great value. 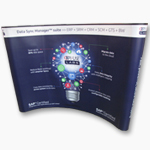 Great looking, professional solution that saves on time and budget. Expanded desk space so you can look your best and get down to business. 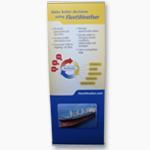 No hassle, lightweight retractable banner wall for instant backdrop. 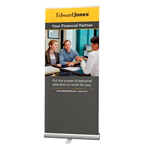 We just received our customized banner display and it is INCREDIBLE!!! 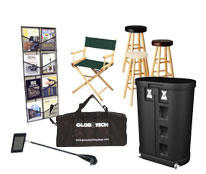 We assembled it and it's sitting outside our office in the hallway right now--we actually bought it specifically for an upcoming presentation but it's too AWESOME to store and not use every day. Thank you for taking care of that for us! The quality is outstanding and we are really, really impressed. 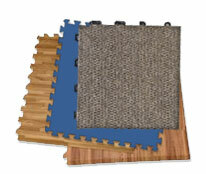 The carrying case is ideal and it assembles quite easily. 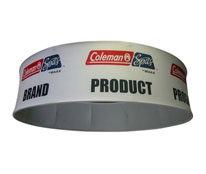 It is just really a top-notch product and we couldn't be more pleased. I recently placed a short notice order with Monster Displays and Patty and Lea went beyond expectations to meet my request. The banner they made turned out great and we couldn't be happier! Thank you Monster Displays! Monster Displays were absolutely incredible! I had a last minute request of which they went out of their way to meet. The display was done quickly and professionally. They were constantly keeping me posted of the updates and guaranteed me quick delivery and they surely kept their promise. 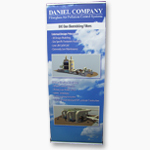 Our display was very much complimented on and was easy to carry and was absolutely beautiful! Thank you. I would not have made it without you. You guys are the BEST! 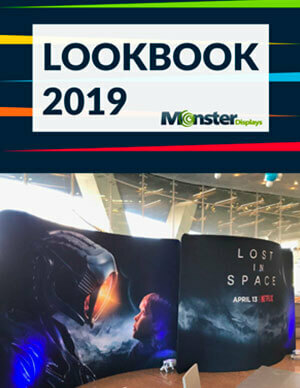 Monster Displays is awesome! 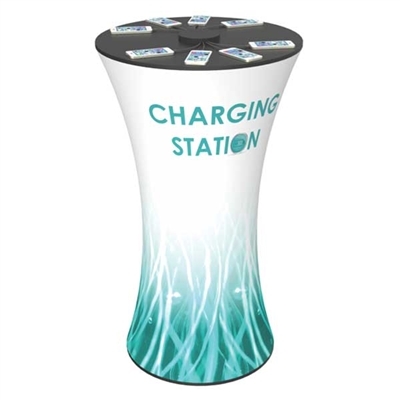 I fully recommend using them for all of your trade show and expo needs. I have used them 3 times over the last year for fast-track, last-minute projects and everything worked like clockwork and came out better than expected. I am really very impressed with them. Plus their prices are great! They have handled all of my normal and my special requests perfectly and have made the whole process very smooth and easy A big thank you to John Godwin and Patty Jones for making my most current project a huge success - thanks for all of your help and special attention to ensure my deadline was met! Cant wait to use you guys again and again and again! 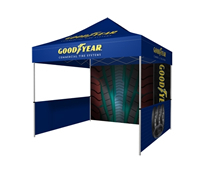 Our recently purchased booth has been extremely easy to assemble as well as storing. 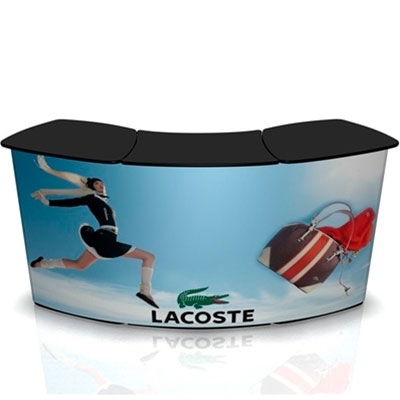 The booth is of high quality and well manufactured. I would like to thank the Monster Display team who went out of their way to ensure we would have our product for an important trade show. Thank you all for your wonderful customer service and equally wonderful display. We needed a rush shipment on a new graphic panel display. The Monster team worked with me to assuaged my anguish and made sure my order was delivered on time and looking sharp. Thanks Monster! 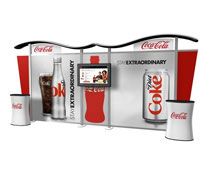 More than 30,000 happy customers over the last 18 years prefer Monster Displays. After shipping hundreds of thousands of displays, we KNOW this business. Trust us with yours. 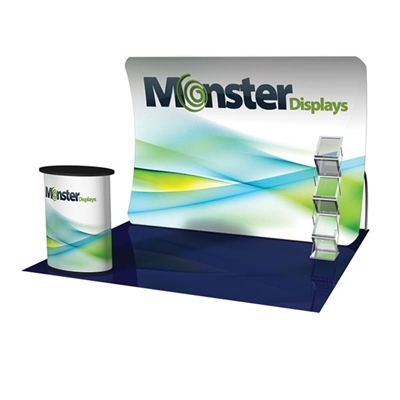 Monster Displays is the leading online source of innovative display solutions for your trade show, event, or promotional marketing strategies. 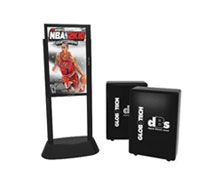 With more than 18 years of successful experience building displays and exhibits, we help power your show with top quality products, superior service, and value prices. 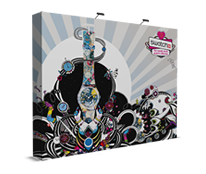 At Monster you will find the most visionary exhibit designs at great prices. 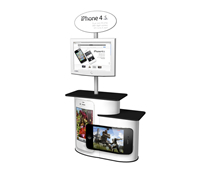 Our online store boasts a comprehensive collection of trade show displays for every taste and budget. 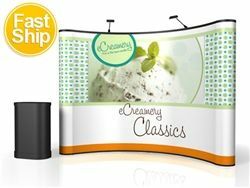 Whether you need a small table top display, a standard 10x10 pop-up display, a banner stand, or the flexibility of a modular trade show system, Monster Displays offers the right solution. In fact, we work with a winning combination in-house production and brand-product distribution to guarantee your complete satisfaction. 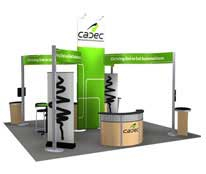 We invite you to enjoy the convenience of working with our team of exhibit enthusiasts and graphic design experts. 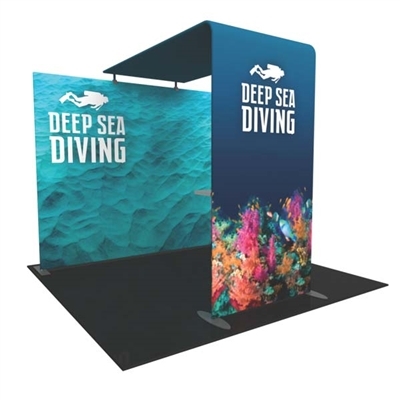 We are ready to become your right-hand in your exhibit marketing efforts, to help you find the best display for your brand and your budget. If you've never thought about how utilizing camera phones, tablets, event management software, or video monitors can benefit your follow up strategy, read on. 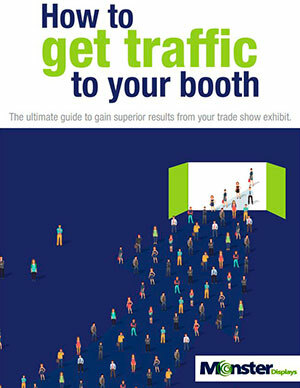 Compare these guidelines with your own exhibit booth to see if you've included as many opportunities to make a lasting impression as you can. Utilizing on-site social media in your trade show for your sales strategy focuses on receiving the qualified traffic that your marketing team is hopefully generating. Many of these items have become a status quo and show up time and time again at conventions – but do they do a good job at motivating a call back?